Recently, the Panda Valley in Dujiangyan, covered in mist, looks like a delicate lightly inked landscape painting. At the moment, a group of new friends comes to this calm valley - they are the teachers and students from the Bullis School. They have come a long way here not only to visit the adorable giant pandas, but also to carry out a unique public education trip to deepen their understanding and feelings of giant pandas. The public education campaign was led by giant panda experts Dr. Jack Owens and Dr. Pat McLaughlin. In view of the unique original ecological environment in the Panda Valley, Dr. Owens first highlighted the matters that need attention for the participating teachers and students, and then a “beautiful giant panda exploration tour” began. 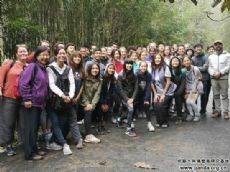 Along the quiet and beautiful footpaths, the Bullis teachers and students arrived at the giant panda house. Watching the charmingly naive giant pandas sleeping soundly on their backs, laying on their sides and scratching like an imperial concubine, or leaning and greedily devouring, the students murmured excitedly while trying to keep their voices down, just as told. While showing the students around, Dr. Owens and Dr. McLaughlin also told them about their living habits and interesting stories of the giant pandas. 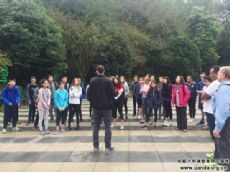 After visiting the giant panda house, the students came to the Panda Education Village, where Dr. Owens explained, from a professional point of view, what zoology was, how giant pandas behave, and how people shall observe their behaviors. After a short rest and discussion followed by a theoretical lesson, the Bullis teachers and students headed for the second training grounds in the afternoon. This was not the first time the Bullis School had planted bamboo on this hillside; however, the enthusiasm and sincerity the students embrace every year were the same, since they all wished that the wild environment of giant pandas would become better and better through their efforts. 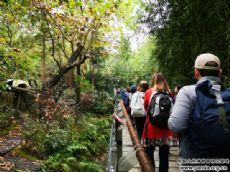 At the end of the activities, the students returned to the foot of the mountain and interacted with the two doctors at the metasequoia woods. The questions about giant pandas one after another, did not stump the students at all. They quickly responded, and they were so happy to share their understanding and feelings about giant pandas that day. At the end, each student received his own certificate of experience, which was not only a proof of the experience, but also gratitude for their active participation in the cause of panda protection.